Completely new and stylishly decorated, this exclusive suite is designed to provide the ultimate in comfort and relaxation. King size bed, or 2 queen-size beds with memory foam mattresses, pillow menu and black-out curtains. 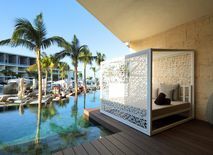 Relax on the furnished terrace and enjoy the Costa Mujeres sun in complete privacy, have a luxurious bath in the hydro-massage bath and indulge yourself in tailor-made luxury with exclusive services such as butler service and 24-hour room service. Enjoy the luxury of walking barefoot from your suite to the Swim-Up pool, accessed directly from your guest room. Revitalise yourself in the hydro-massage pool, enjoy state-of-the-art technology with your 50” flat-screen TV and enhance your stay with music via the iPod dock. 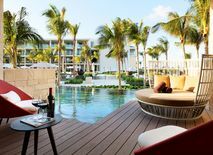 Savour Costa Mujeres with a wine at the ideal temperature, thanks to your wine climatiser, or have a delicious premium selection coffee with the Nespresso machine included in your suite. Live a unique experience. Experience a treat for the senses on your suite’s amazing terrace, and have a relaxing hydro-massage bath while you contemplate the beauty of Costa Mujeres. 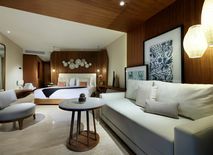 This spacious accommodation, with a separate lounge, thoughtfully selected furniture, modern technology and luxury services guarantees you a unique and exclusive stay. Spacious. modern accommodation with a separate lounge and a second toilet for additional privacy during your stay. 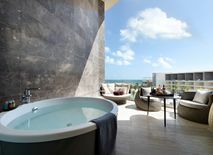 You will be delighted by the elegant, sophisticated décor, and you will love pampering yourself in the hydro-massage bath, having a delicious premium selection coffee or simply gazing at the view from your exclusive terrace with hammocks. Enjoy the luxury of direct access to the Swim Up pool from the hotel’s most exclusive suite. 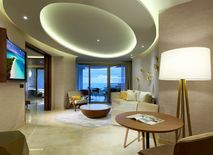 A separate lounge and a second toilet to guarantee privacy, modern technology to enhance your stay, including video-games and a console, a interactive TV, wine climatiser and exclusive services such as 24-hour room service and Turn-Down Service to ensure a first-class luxury experience.